A market town in central Kent, Ashford was likely settled in the late 9th century and was incorporated as a town in 1423. Ashford was the home of Jack Cade, leader of the uprising known as Cade's Rebellion. The parish church is largely 13th century, with 15th-century additions. The town's name tells a lot about its origins; the name Ashford means a grove of ash trees near a ford. It this case the ford was across the River Stour, and the ford was the reason why a settlement grew up. The area was settled as long ago as the Iron age, as evidenced by a barrow mound on Barrow Hill. The Romans found iron ore in the Ashford area and established a number of mines in the region. Ashford served as a central point for the Weald, and iron ore was brought here to be processed. The Roman town stood north of the present town centre, which grew up after a Danish raid in AD 893 caused local residents to gather together. A Saxon lord granted the residents a plot of land to build a fortified town to resist further Danish attacks. At the time of the Domesday Book, Ashford manor was owned by Hugh de Montford, the powerful Constable of England. Richard Plantagenet (1469 - 1550) was a bricklayer working at Eastwell, just outside Ashford. Richard claimed to be the son of Richard III, which would have made him rightful king of England, though he apparently made no claim to the throne. Plantagenet is buried at Eastwell, and his grave can be visited. A modern theory suggests that he may have been Richard, Duke of York, one of the Princes in the Tower. Ashford owes much of its post-medieval prosperity to its location. Just as the original settlement grew up around a ford, so in the 19th century Ashford found itself at a meeting of major rail lines, and its role as a train hub guaranteed continuous growth into the 20th century. Unfortunately, much of that growth swept away the historic buildings in Ashford's town centre, save for a cluster of timber-framed buildings on Middle Row, near the church. 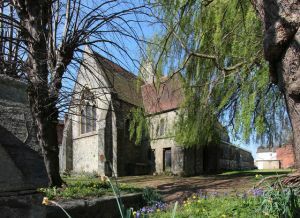 St Mary's is the oldest building in Ashford. It dates to the 13th century and boasts a notable memorial brass to the first rector. The church was enlarged in the 15th century by John Fogge, who is buried in the church. In the 17th century, a grammar school was founded within the churchyard. The school building now serves as a local museum. Three miles away is Godinton Manor, a brick manor on the site of a 12th-century hall. The manor is set in beautiful gardens which are open to the public.